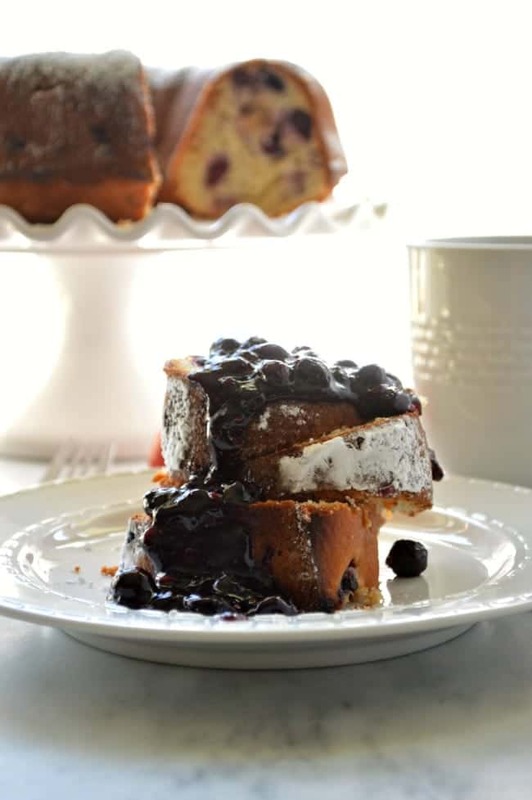 Blueberry Peach Pound Cake with Boozy Blueberry Sauce is a celebration in summer produce! 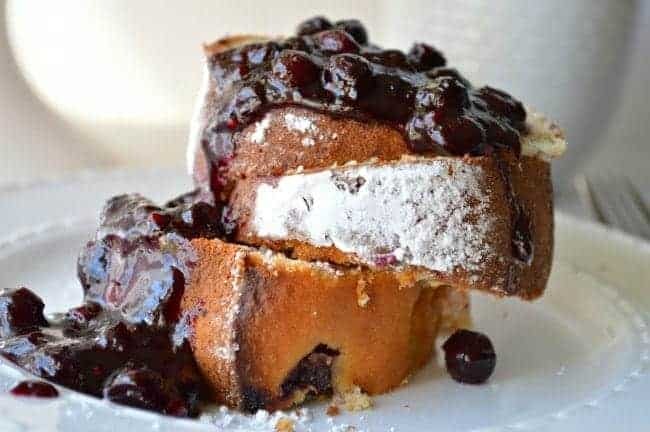 Buttery tender cake loaded with fresh peaches and blueberries and topped with a blueberry rum sauce; so good! Two things: FIRST. Chad and I found a local rum distillery and it’s seriously amazing. Second, I actually made this cake with lemon plums instead of peaches, but it’s now peach season and either will work. Y’all know I love to hoard all the summer produce, but this year I started early and ended up with like 4 pints of blueberries in the fridge. I made Blueberry Pie Bites, Blueberry Lemon Muffins, and there were still more. Soooo I made Blueberry Peach Pound Cake and added a Boozy Blueberry Sauce for fun. The rum distillery we found is in Belmont, NC. It’s called Muddy River and if you are in the Charlotte area I highly recommend going for a tour. The rum is good enough to drink on it’s own, you learn a lot about the process, and you can take home a glass that gets you back in for tours indefinitely! 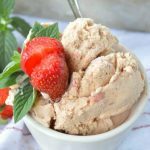 If you decide to go visit, there are a few great places to eat and drink right there in Belmont. Please take my advice: if you go to the String Bean, order the Cow Pig Burger. It inspired my bacon-ful Trailblazer Burger. If you like it spicy get the Angry Cow Pig. Another piece of advice: don’t go to Nellie’s Southern Kitchen. It took forever to get a drink, the entrees were overpriced and I had the WORST mac n cheese of my life, and the carrot cake that we were told by a friend to get because it’s totally amazing? I’ve had better. Instead, you should walk literally around the corner to 10 Catawba and have dessert at Bar 10. 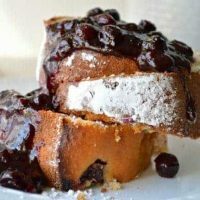 Or you can just buy the Muddy River Spiced Rum and go home to make this pound cake with boozy blueberry sauce. 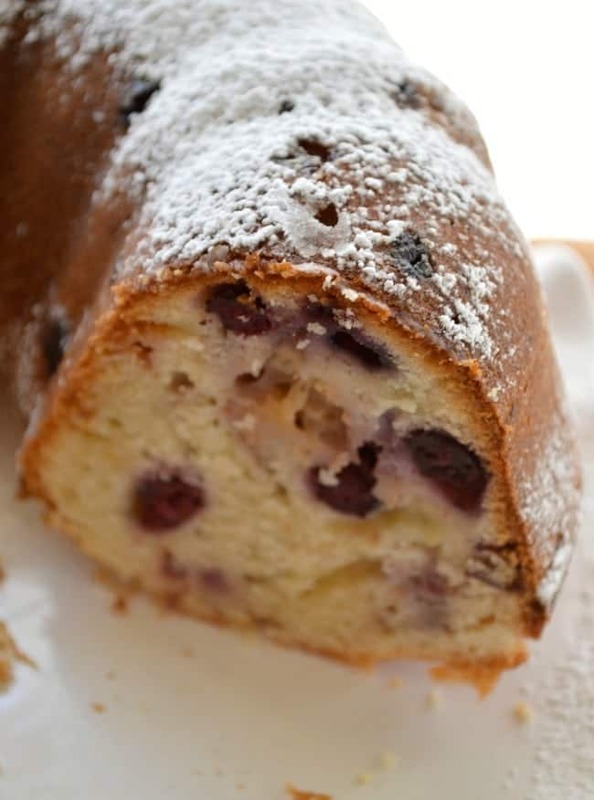 Blueberry Peach Pound Cake with Boozy Blueberry Sauce is a celebration in summer produce! Buttery, tender cake loaded with fresh peaches and blueberries and topped with a blueberry rum sauce; so good! Preheat the oven to 350°F. 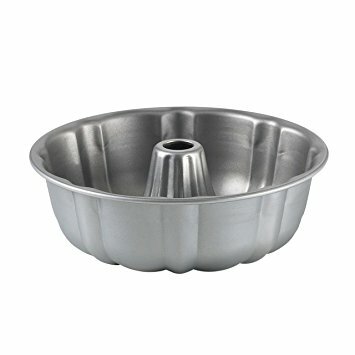 Butter and flour a 10 inch bundt pan. In a large bowl beat together the butter and sugar until fluffy. Add the eggs one at a time, beating well between each addition. Then mix in the buttermilk and vanilla. In another bowl whisk together the cake flour, baking powder, and salt. Add the dry mixture to the wet and mix until just combined. 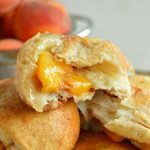 Fold in the peaches and blueberries, pour the batter into the prepared pan and bake for 60 minutes, testing with a toothpick for doneness. 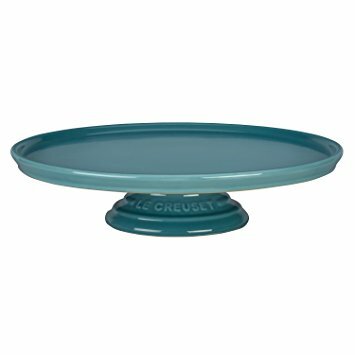 Let the cake cool for at least 10 minutes before carefully turning out of the pan to cool completely. To make the Boozy Blueberry Sauce toss the blueberries with the granulated sugar. Whisk together the cornstarch, rum, and cold water. Add the blueberries and rum mixture to a small saucepan and bring to a simmer. Cook over medium heat, stirring occasionally until the sauce thickens. 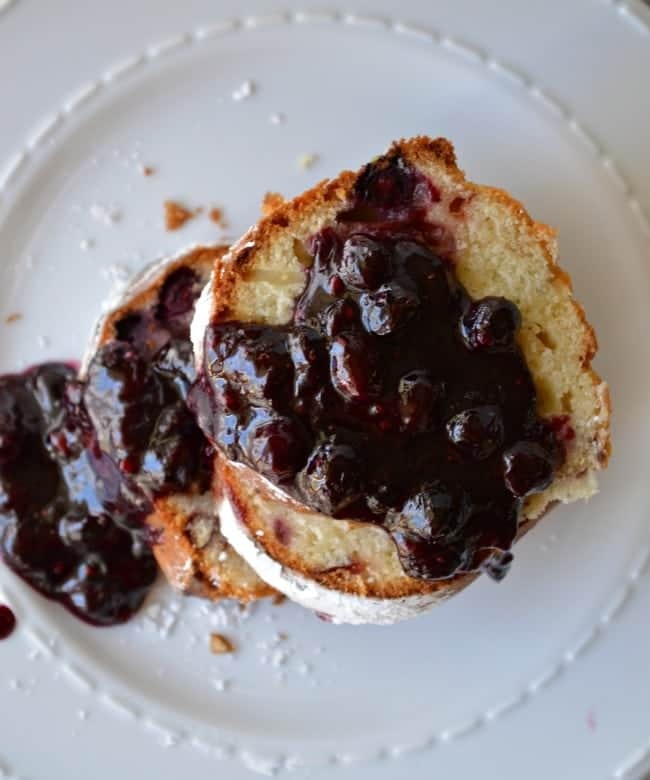 Dust the cake with the powdered sugar, slice, and serve with the boozy blueberry sauce. 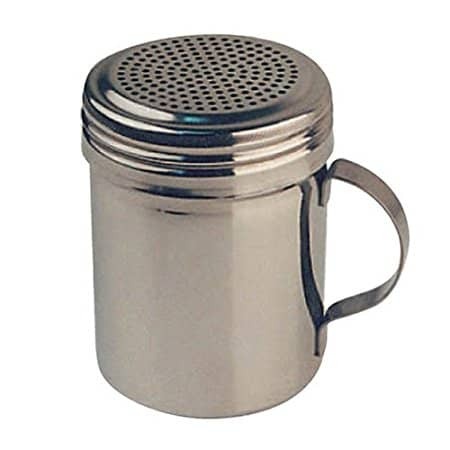 If you don't have buttermilk handy you can add ½ teaspoon vinegar or lemon juice to ¼ cup milk. 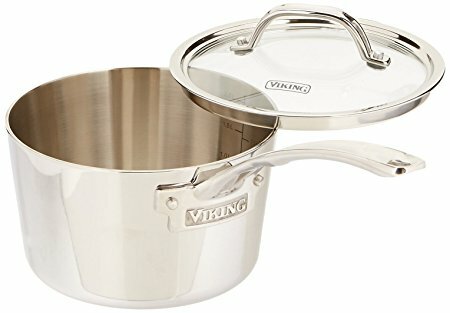 Let it stand for about 5 minutes before using. 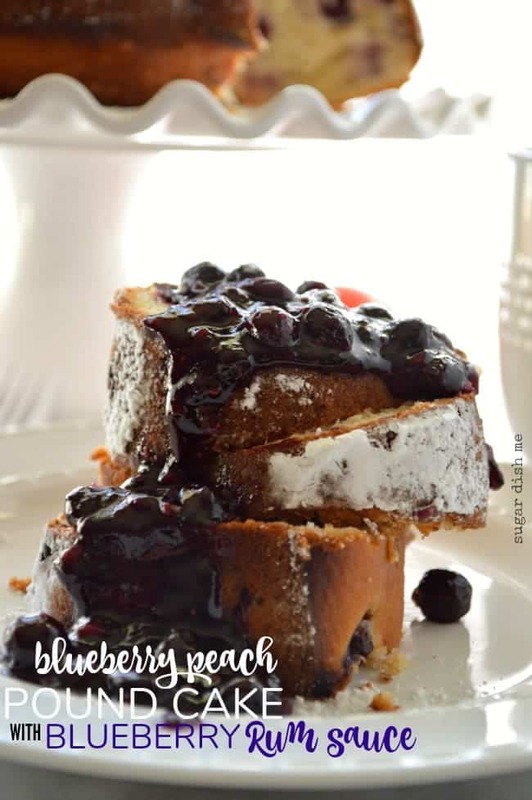 This recipe was adapted from the Blueberry Peach Pound Cake in the Taste of Home Baking Classics Book which is a favorite in my kitchen! 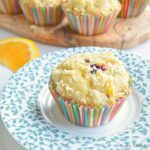 Blueberry Biscuit Bombs which are simple, tasty little treats that are perfect for breakfast, brunch, or dessert. 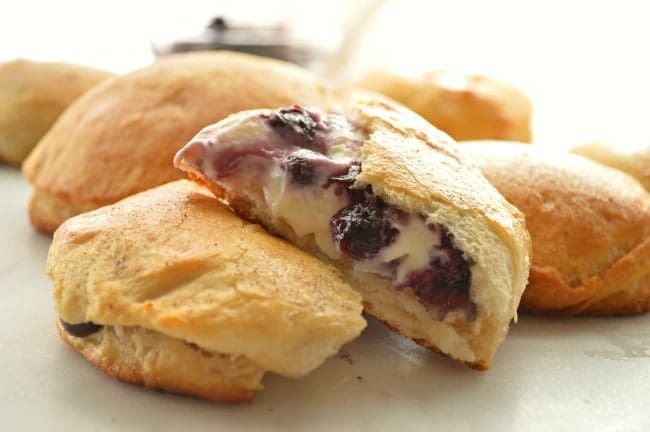 Flaky biscuits are stuffed with cream cheese and blueberry pie filling for a biscuit bomb your guests will swoon over. 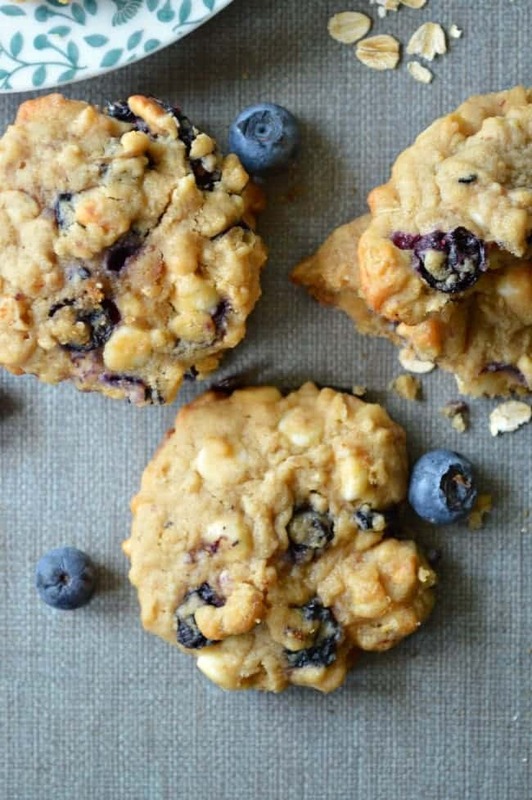 White Chocolate Blueberry Oatmeal Cookies are soft and chewy cookies loaded with fresh fruit, oats, and protein! 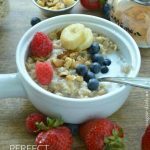 The perfect grab-n-go breakfast or snack. LOL about your friend and the carrot cake at Nellie’s. 😉 The carrot cake used to be really good, and now it is a disappointment. They serve it ice cold from the fridge (gross) and cover it with nasty caramel sauce. I did not have a wait the last time I went. This Blueberry Peach Pound Cake looks way better, and I definitely need your Boozy Blueberry Sauce over ice cream immediately. Hahahaha — I think that me, you, this rum, and a kitchen, could make a carrot cake that would put Nellie’s to all the shame. Boozy Blueberry sauce + ice cream is EXACTLY how you should spend the afternoon.